Responds in 1 power line cycle response with 0.1% accuracy. DIN Rail mounted, digitally programmable. 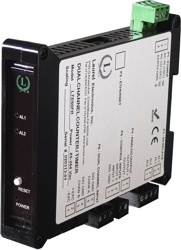 The Laureate AC RMS input transmitter and signal conditioner provides six voltage input ranges and four current input ranges, all factory calibrated and jumper selectable. A special 5.000A range utilizes a built-in 0.01 ohm shunt to accept the output of 5A current transformers, with no need for a stepdown transformer. The current readings can easily be scaled digitally as needed. High common mode rejection allows stable readings with current shunts located on the high side of the line. Digital filtering is selectable for noisy signals. True RMS precision circuitry is used to determine the root-mean-square of complex waveforms from DC to 10 kHz. Spikes up to 3.0 times the maximum of each range are accurately measured. Accuracy is 0.03% of full scale for the transmitters with 1 Megohm input resistance, signals from DC to 10 kHz, and signal amplitude down to 0. The crest factor (Vp / Vrms) is 3.0 at full scale, increasing to 300 for a signal amplitude of 1% of full scale. A version with 10 Megohm input resistance is available as a factory special, but decreases the maximum frequency from 10 kHz to 1 kHz for three of the voltage ranges. True RMS readings in as little as one 50/60 Hz AC line cycle are unmatched in the industry. Such a high read rate allows anomalies to be detected and alarmed before they become expensive problems. On/off control and alarm can be achieved dual solid state relays, which are standard. Transmitter can also capture peak and valley for times as short as one 50/60 Hz AC power line cycle. AC or DC coupling is jumper selectable. AC coupling is suitable for applications such as measuring the ripple on a DC power supply. Multiple integral cycles are averaged for signals above 50/60 Hz. A single cycle is captured for signals from 3 Hz to 50/60 Hz. Below 3 Hz and at DC, the capture rate is every 333 ms.
* For purposes of accuracy calculation, the 600V range is 2000V (20,000 counts), and the 5A range is 20A (20,000 counts). Note: Extended allows custom curve linearization and rate from successive readings. Note: The same AC RMS signal conditioner can be user configured for AC Volts or AC Amps, and is precalibrated in EEPROM for all AC Volt and AC Amp ranges listed.